Two days after Jaime died, her oldest brother and his wife made it to town with their kids (after a 1,200 mile drive! ), and we got to work deciding the nitty gritty details that we spent the first 48 hours avoiding talking about. Cremation vs. Casket. Church Funeral vs. Outdoor Memorial Service. Who will lead it? What music do we want included? The details went on and on. 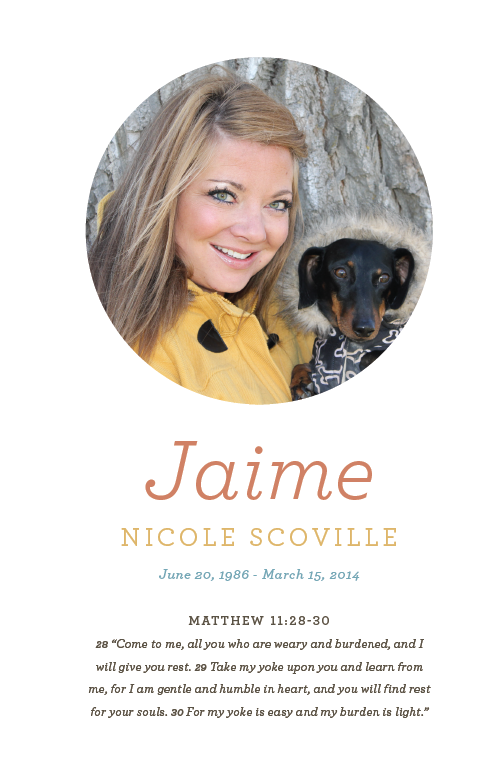 When it came to writing up Jaime’s obituary to have printed in the local newspapers and used in the program, we wanted it to be perfect. Our immediate family sat in a circle in our guest bedroom, throwing out ideas of things we wanted included and using my aunt’s obituary as a template. Though we wanted all the key details included, we all felt that Jaime was so young and vibrant when she died – we didn’t want a boring old obituary that could have been written about a 90 year old. I think she would have liked it. After we got it written up, we had about 18 hours before the deadline to submit it to the newspapers for printing. That night a few of us were sitting around drinking, reminiscing about Jaime, and the obituary came up. A good friend of mine took off work for the entire week to be here with us, and she is an editor by trade, so she offered to take a look at it before we submitted it to the papers and the printer for the program. When she got to the standard “she is survived by…” line, her knee jerk reaction was Josey, you and Katrina were more than parentheses to Jaime! You see, the standard way to writing out who the deceased leaves behind is “she is survived by Charlie (Josey) S**** of ****, Colorado.” The “married in” person is always in parenthesis after the blood relative’s name. I had never thought about it, but she was damn right. I WAS more than a parenthesis to Jaime. So we rewrote it. I’m sure we’re not the first people to do this, but at the time (and a few drinks deep), it felt like we were reinventing the wheel, and it felt GOOD. Jaime is survived by many loved ones; her loving parents, Steve & Joan; her two adoring brothers, Ben & Charlie: Ben & Katrina of W*, Minnesota and Charlie & Josey of R*, Colorado; her precious niece & nephews – Jonah (4), Stella (2), Holden (1.5), and Harvey (2 months); her grandfather Elmer * of S*, Missouri; her aunts, uncles, and cousins (the W* & A* Families) all of S*, Missouri; her boyfriend, Trevor *…and her loyal dog, Jack. This reminds me so much of when one of my best do friends died at age 25. Her closest friends sat up reminiscing and drinking. We made a poem for all 5 if is to read parts of at the memorial. She didn’t have a headstone for a year or so, because of the cost. Each year we visit the cemetery and have brunch in honor of her on her birthday. One year, we walked up to see the most beautiful headstone with photos of her as a darling little girl and a vibrant, beautiful woman. One of our friends walked around and noticed the entire back of her headstone was engraved with our poem and a photo of all I is together. It’s one of the most special moments I hold onto. GAH! Thanks for the heads up about the pingback. I just called and had them remove it. What a great story about your friend’s headstone. SO special! I just love it. Just from reading your blog I am certain you are so much more than a parenthesis to Jaime. I’m very glad you made this last minute change. I love the change as well, it seems fitting for how close you all were. In reading all your posts about this it really is a good reminder that all people, no matter how young, single or married, should have a will of some sort stating how they’d like things done in case they pass away, that way families don’t have to be dealing with figuring out all that on top of the grief. What a beautiful obituary and so fitting for someone lost way too soon. Your family remains in my prayers. Hopefully Stella is handling it ok, so hard with her so young. I am using a sleepless baby night to get caught up on your blog. I haven’t commented much do to all of the nursing and burping, but I have to say that I am heartbroken for your loss. Just so sad for your family. Jaime seems like a beautiful woman inside and out. I’m sure you will miss her desperately. I’m so sorry.